Dr. Anne Tournay is a pediatric neurologist and clinical professor of Pediatrics and Neurology at UCI. She is a long-time friend of our organization, and the lead Neurologist at the CHOC Children’s Down Syndrome Clinic, created through an alliance between CHOC Children’s and the Down Syndrome Association of Orange County (DSAOC). She has a genuine compassion for children, teens and adults with Down syndrome and other developmental disabilities, and that attribute, combined with her knowledge and experience, makes her a valuable team member at both the CHOC Children’s Down Syndrome Clinic, and the Adult Down Syndrome Research Clinic at UCI. 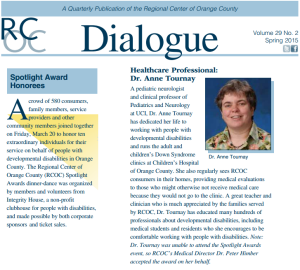 We are thrilled to see her dedication recognized, and congratulate Dr. Tournay on her Spotlight Award.